Have I said how much I LOVE kids stuff? Clothes, toys, decorations, quilts- its where all the fun and colour I can’t bring myself to display as an adult goes. Annnnd because I don’t have kids I am pro aunty and crazy lady to many of my friends children who bear the brunt of my love of buying for kids. Tough life huh. Just this morning I drove past an interior design place that had AMAZING fox wallpaper- I will be sourcing that one for sure! There are many many products that are marketed towards parents and kids, lots of which are just a waste of money. Now I’m not exactly one for practicality in the spending department, but come on- ever heard of a pee pee tee pee? Its a fabric cone that you can place over a little boy when changing his nappy so if he wees then it is contained. Or you could use a face washer?! I have changed thousands of nappies having worked with babies for 6 years and I managed to avoid pee flying everywhere. Plus some wriggle so much anything you place there is going to fall off! Good money spinner though, but in my opinion a serious waste of money. Good quality clothing on the other hand is not. 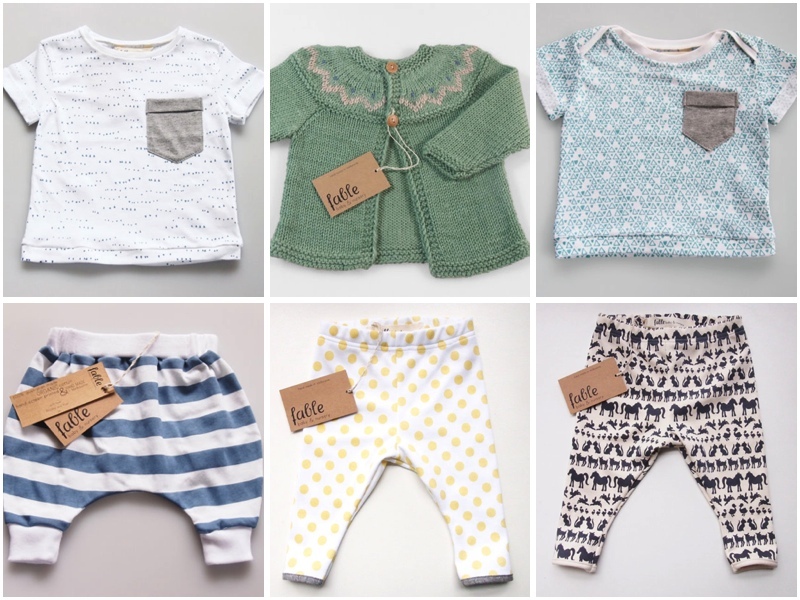 Fable Baby is a Melbourne label making clothes for littlies out of amazing organic materials including cotton, wool and silk, and hand printing the fabric with their own colours and designs. I visited their workshop and it is such an amazing work space. To me the best part is that these girls do everything themselves- printing their own fabric and sewing up all the clothes right there in Brunswick. All the designs are for newborn to 2 years old and are so super soft and easy to wear. I really love the colour palette and prints that are quite neutral so great for gifts for those having a surprise baby, or super cute non-pink options for those of us who don’t do pink. They have been doing a roaring trade at markets and also have an online store through Etsy. This label has only been up and running for 7 months so I’m looking forward to seeing how it grows from here on! Come on, organic, completely hand made in Melbourne and cute- go shop!